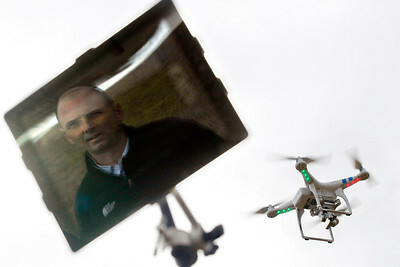 Matthew Apgar - mapgar@shawmedia.com Robert McClurg of Wonder Lake is reflected in the screen of his tablet as he operates his remote controlled drone on Thursday, March 26, 2015 at Emricson Park in Woodstock. McClurg is a recreational drone user who has also used it commercially with his business, Turnkey Digital. 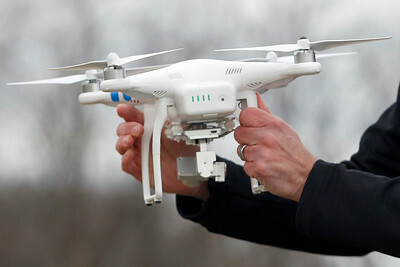 Matthew Apgar - mapgar@shawmedia.com Robert McClurg of Wonder Lake holds his remote controlled drone on Thursday, March 26, 2015 at Emricson Park in Woodstock. McClurg is a recreational drone user who has also used it commercially with his business, Turnkey Digital.